Who knew a near accident could lead to murder? Sheriff Dan Rhodes stops to help a man, Cal Stinson, whose car was run off the road. Of course, in Clearview, Texas, things are rarely simple. The other driver was still on the scene, and he was the one holding a gun on Stinson and Rhodes. With a bit of distraction, Rhodes is able to disarm the gunman and take him to jail. Stinson continued on his original route to the old schoolhouse, a nostalgic visit. Then things got complicated. There are some who think the schoolhouse should be restored and others who can’t wait to see it demolished. The woman across the street still cleans the school on a regular basis, at least the parts that don’t look like they’re apt to fall down on her head as she mops. This time she finds more than dirt. It’s the body of Carl Stinson, except in Clearview fashion, that’s not who he really is. It’s a sure bet that the man’s visit to the school wasn’t to see where his dear grandma learned her letters and numbers. Rhodes has to deal with not-so-bright criminals, the dueling families determined to get their way with the school, and his desire for lunches that would have his wife, Ivy, frowning over his choices. Seepy Benton is now a private investigator, his latest incarnation, always ready to help on a case that has Rhodes stumped, assistance welcome or not. It just may take a group effort to discover the dead man’s identity and that of his killer. This is the twenty-fourth book in the popular series. It is sadly, also the last. Author Bill Crider passed away about a year ago. Before leaving, he led readers once more to visit Clearview, to see the indifferent cats, to talk to Seepy, Hack and Lawton, Clyde, and Ivy and to romp with the dogs, Speedo and Yancy. It is a fitting end. Crider wrote several other series, including the Professor Sally Good and Professor Carl Burns mysteries, Westerns, children’s books and more. For characters you’d love as friends, settings you’d long to visit, and mysteries that are solved with brain power instead of fire power, Crider continues to deliver. 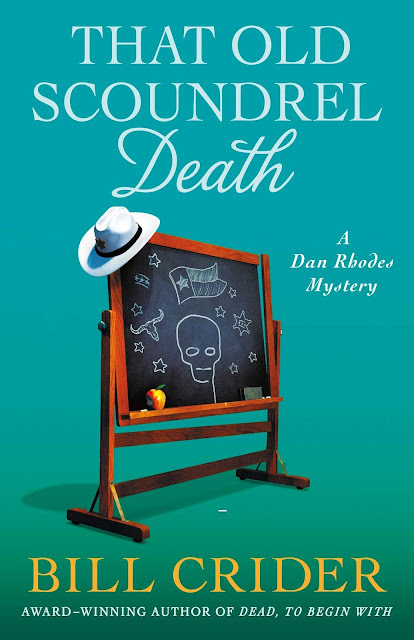 To enter to win a copy of That Old Scoundrel Death, simply email KRL at krlcontests@gmail[dot]com by replacing the [dot] with a period, and with the subject line "scoundrel,” or comment on this article. A winner will be chosen April 13, 2019. US residents only. If entering via comment please include your email address. And if entering via email please include your mailing address in case you win. You can read our privacy statement here if you like. Check out other mystery articles, reviews, book giveaways & mystery short stories in our mystery section in Kings River Life and in our mystery category here on KRL News & Reviews. And join our mystery Facebook group to keep up with everything mystery we post, and have a chance at some extra giveaways. And check out our new mystery podcast which features mystery short stories and first chapters read by local actors! A new episode featuring a mystery short story by Julia Buckley went up this week! Love the cover, would really like to read. It's so sad this will be the last book in the series. Too bad this is the last book. Crider was such a great writer.